As you might have guessed, I've just finished reading 'Is Everyone Hanging Out Without Me? (And Other Concerns)' by the hilarious Mindy Kaling and I loved it. I almost didn't want to keep reading because I was worried I would finish it too fast, but alas here we are! 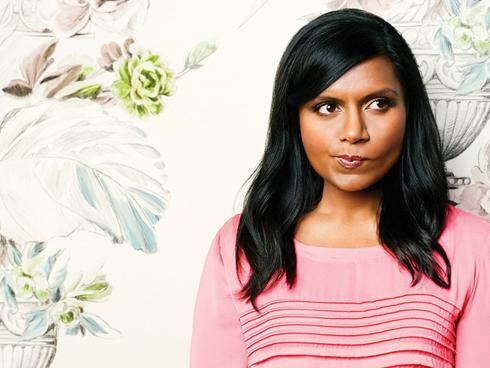 For those of you who don't know Mindy is a comedy writer, actress and star of her own TV show 'The Mindy Project' which is hysterical and you should watch it immediately. The highlight of the book for me was that, because I watched her show regularly, I read it with her voice in my head, like she was personally reading aloud just for me, and it made everything so much more amusing than if I was reading it in my own voice. It also helps that she writes so conversationally, it's almost like she's in the room with you. What I love about Mindy, both on TV and in print, is that she is so honest and not afraid to laugh at herself. She does embarrassing things like the rest of us but she comes across as funny and endearing. She obsesses over hot male celebrities, she knows what it's like not to fall into the media's idealised standards of beauty and she's happy enough sitting at home in her pjs in bed working on her laptop. Mindy's also worked really hard to get where she is today. While the book starts off talking about her childhood, it also reveals how she got her job as a writer on US version of 'The Office' way back when it first started and how she both wrote and acted in a hit comedy play before that. As far as role models go, I think Mindy is a pretty great one - she's climbed her way to the top and stayed down to Earth too. The good/bad news is that the book ends before we get to read about Mindy's new latest venture, 'The Mindy Project' so I've got my fingers crossed that she will write a sequel and fill our lives with more of her insightful observations and anecdotes! Having read the book I am also now much more interested in watching 'The Office' which is currently on Netflix, and reading about the careers of Mindy's fellow comedy writers and actresses, Tina Fey and Amy Poehler, whom she expresses huge admiration for. If you've read either of the biographies by these ladies do let me know if they are worth the read!